Watch the GDR (Genesis Demolition Recycler) up close while demolishing a bridge. All Genesis Demolition Recyclers are covered by a 12-month, 1,500-hour (whichever occurs first) warranty. 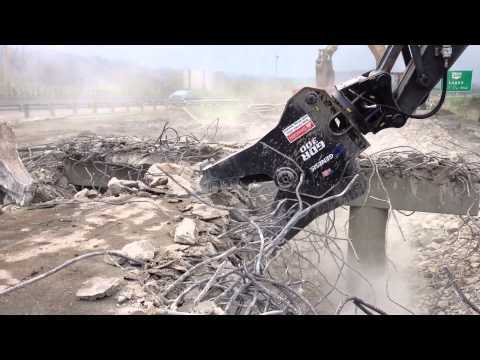 A powerful demolition tool, the Genesis Demolition Recycler is the all-purpose processing and cutting attachment for high-reach and standard projects as well as road and bridge demolition. Genesis Attachments designed the Demolition Recycler for concrete processing as well as downsizing concrete and debris for recycling. The GDR minimizes dust, noise and flying debris while maximizing productivity. With pulverizer, concrete cracker and shear jaw options for the 150, 200 and 300 models, and pulverizer and concrete cracker jaw options for the GDR 400, the GDR features 360-degree rotation for maximum maneuverability, a powerful large-bore cylinder, and easily-replaced teeth and blades to minimize maintenance downtime. An extended upper plate and chin aid in positioning material for processing, and the GDR operates on 28,000 lb. to 100,000 lb. excavators.